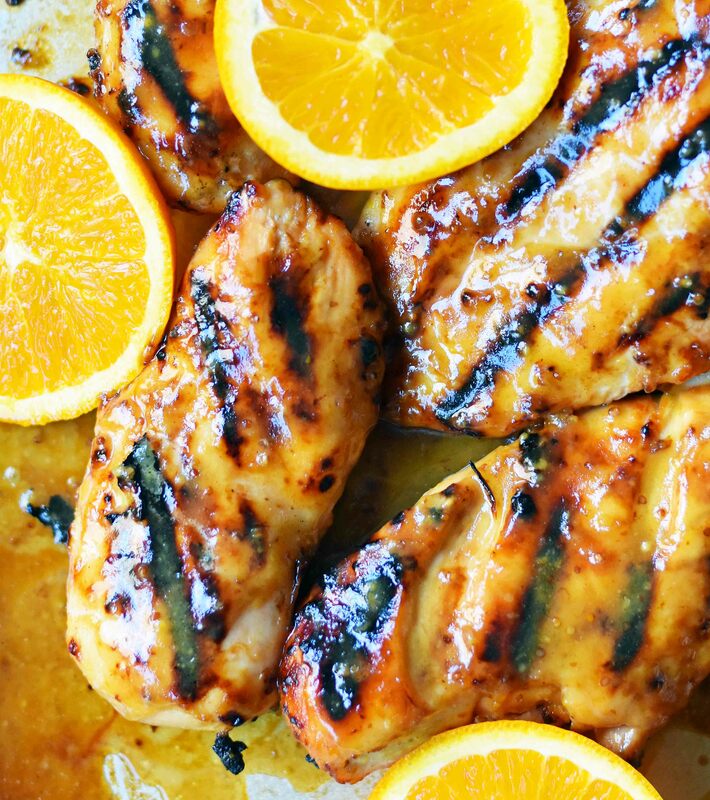 Sweet and Tangy Honey Mustard Grilled Chicken is perfect for a summer BBQ. Tender chicken with a flavorful honey dijon sauce. 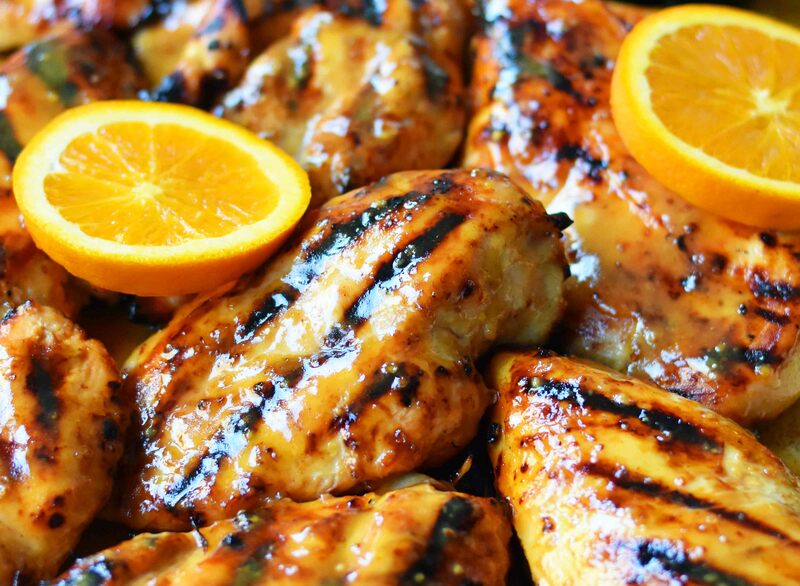 Since grilling season is upon us, I am sharing some of our favorite chicken marinade recipes. 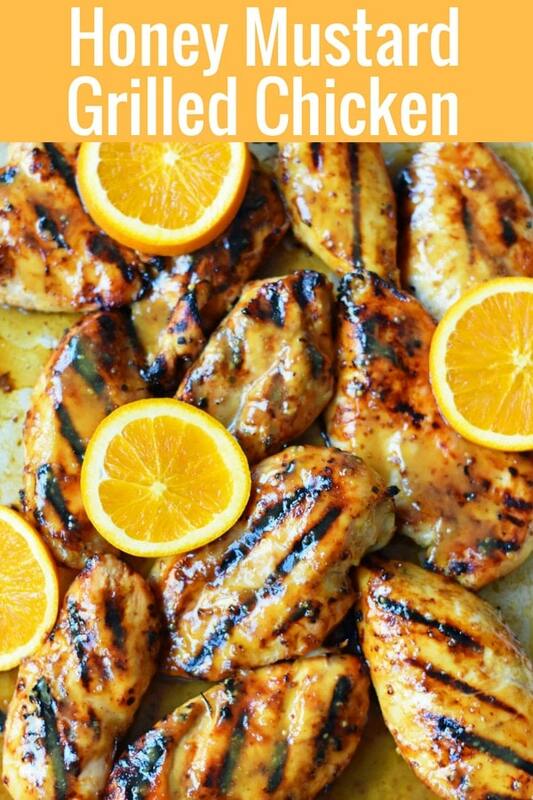 If you haven’t tried My Best Chicken Marinade Recipe, you need to put it on the list too! Honey and mustard go together like peanut butter and jelly. The tanginess of the dijon mustard and natural sweetness of the honey are the perfect marriage. This honey mustard sauce serves as both a marinade and a sauce. The chicken is left to marinate in a portion of the sauce and the remaining sauce is brushed on while grilling. This helps to flavor the chicken from within. 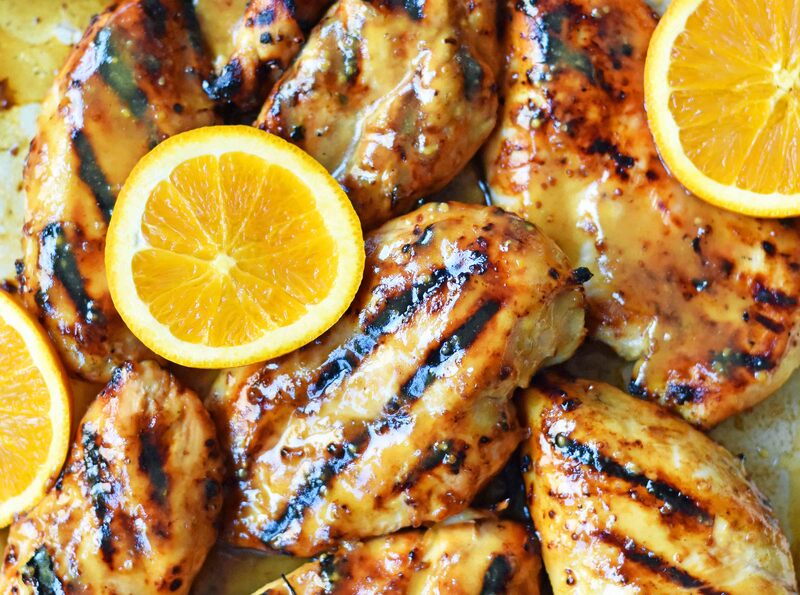 The key is to let the chicken sit in this honey mustard marinade for at least 30 minutes. By poking small holes with a fork in the chicken, it allows the marinade to penetrate the chicken. Once the chicken goes on the grill, have the extra sauce you set aside ready to go. A brush is always handy since it makes brushing the marinade on the chicken, while cooking, a breeze. What is in the Honey Mustard Marinade? It all starts with a mix of dijon and traditional mustard, honey, olive oil (may substitute canola or vegetable oil), garlic powder, salt, and pepper. It’s made with such simple ingredients. 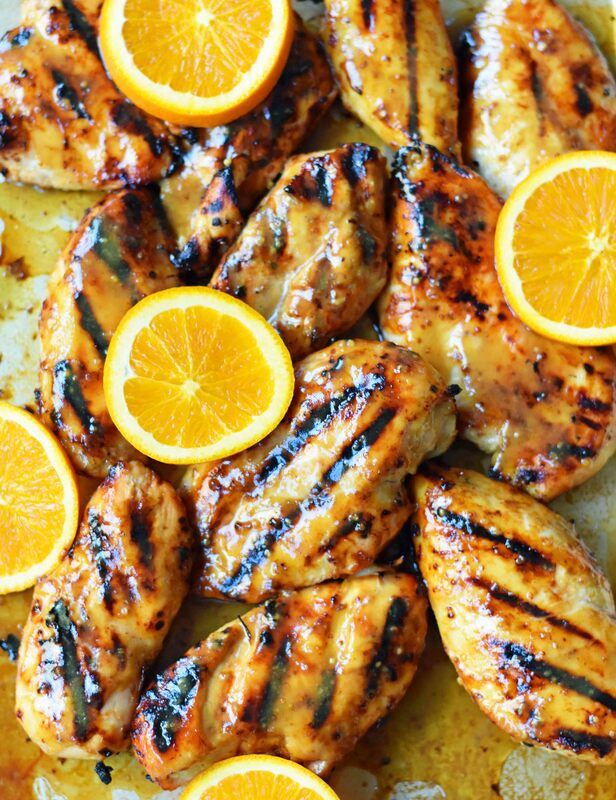 How long should you cook the chicken on the grill? It depends on the thickness of the chicken breast. If you prefer to use thinly sliced chicken breasts, they will cook quicker than thick chicken breasts. The rule of thumb is usually 3-5 minutes per side on medium to medium-high heat. The FDA says that chicken is fully-cooked at 165 degrees. Keep in mind that chicken continues to cook slightly once you remove from the grill. 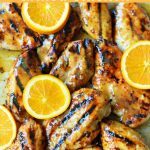 Sweet and tangy honey mustard grilled chicken is perfect for your next BBQ! Place chicken breast in a large Ziploc bag. Using a fork, pierce small holes in the chicken. In a small bowl, whisk together mustard, honey, olive oil, garlic powder, salt, and pepper. Pour 1/2 of honey mustard marinade into bag with chicken. Set aside remaining honey mustard sauce to use to baste on the chicken. Let marinate for at least 30 minutes in the refrigerator. Heat grill to medium or medium-high heat. Once the grill is heated, place chicken on the clean grill. Cook for 3-5 minutes per side, depending on the thickness of chicken breast. The FDA recommends the internal temperature to be 165 degrees. The chicken will continue to cook for 1-2 minutes after removing from the grill. After turning the chicken one time, brush remaining honey mustard sauce all over chicken. After removing chicken from the grill, brush the second coat of sauce so it is completely covered. Let rest for several minutes before cutting so it stays nice and juicy. This looks so yum! Have you ever tried curry powder in your sauce? Well anyway, honey mustard is just so good on chicken and once it’s grilled, it is texture perfection. Thanks for sharing! I made this for dinner last night and my family loved it. Served it with rice, which was perfect. Thank you for all your great recipes….I love your blog! I’m excited, so excited to make this recipe today! I read in your blog that you combined two mustards to create the honey mustard, but in your list of ingredients it states only 1/3 cup of one kind of mustard. Please let me know what instructions I should follow? Hi, I took a screen shot of one your stories on Instagram where you showed that you made dinner to bring someone. It looks like it might be this chicken, but there were carrots and potatoes in the pan too. I would love to make the same meal for a friend. Just curious if this is the same dinner.